Collected comic strips from the pages of Doctor Who Magazine, featuring the Doctor and Clara as played by Peter Capaldi and Jenna Coleman. 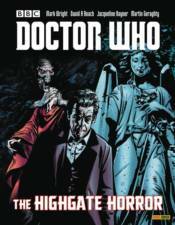 The Highgate Horror collects together all the most recent stories by leading Doctor Who writers and artists, from the highly acclaimed comic strip in DWM and includes a wealth of exclusive, brand-new material revealing how the strips were created, featuring contributions and commentary from the writers and artists. The collection contains six comic adventures: 'Space Invaders!, 'Spirits of the Jungle,' 'The Highgate Horror,' 'Dragon Lord,' 'Theatre of the Mind,' 'Witch Hunt,' and 'The Stockbridge Showdown.' 'The Stockbridge Showdown' is a special celebratory adventure, which first appeared in the 500th issue of Doctor Who Magazine, and includes guest artists and characters from the comic strip's past! DOCTOR WHO SERIES 01: WINTER'S DAWN, SEASON'S END HARDCOVER DOCTOR WHO SERIES 3 VOL.03: SKY JACKS!